Flavor Paper and UM Project collaborated at the Collective Design Fair to bring Conduct, a conductive wallpaper installation that could do away with wiring. Conductive inks could power switches and outlets without the need for wire circuitry. Two companies, Flavor Paper and UM Project have produced conductive wallpaper that turns walls into powerful works of art. Energy-efficient, practical, safe and durable, the technology of conductive inks and pastes is finding various applications across many industries. From solar cells (the largest consumer) to automotive casings, multi-purpose sensors to flexible and printed electronics, these versatile materials are finding many homes. In the United States, the conductive ink market is expanding continuously and it’s expected to reach a value of $200 million USD by 2024, which is up by 25% from 2014 (or $150 million USD). Globally, the market was estimated at $3 billion USD in 2015. For home use, conductive paints and inks are already available in the market. They do away with all the energy-consuming wires running through walls and still bring power to the right places. You can draw wires into beautiful patterns on a variety of materials, such as paper, wood, or plastic. Flavor Paper is a company that produces customizable wallpaper for screen printing and digital printing. Among the company’s clients are big brands like Google, eBay, and MTV. In order to incorporate interesting new designs for its products, Flavor Paper also partners with artists and foundations including Lenny Kravitz and the Andy Warhol Foundation. The UM Project is a company founded in 2004 that is more of a creative design studio that produces mainly furniture and other unusual goods. 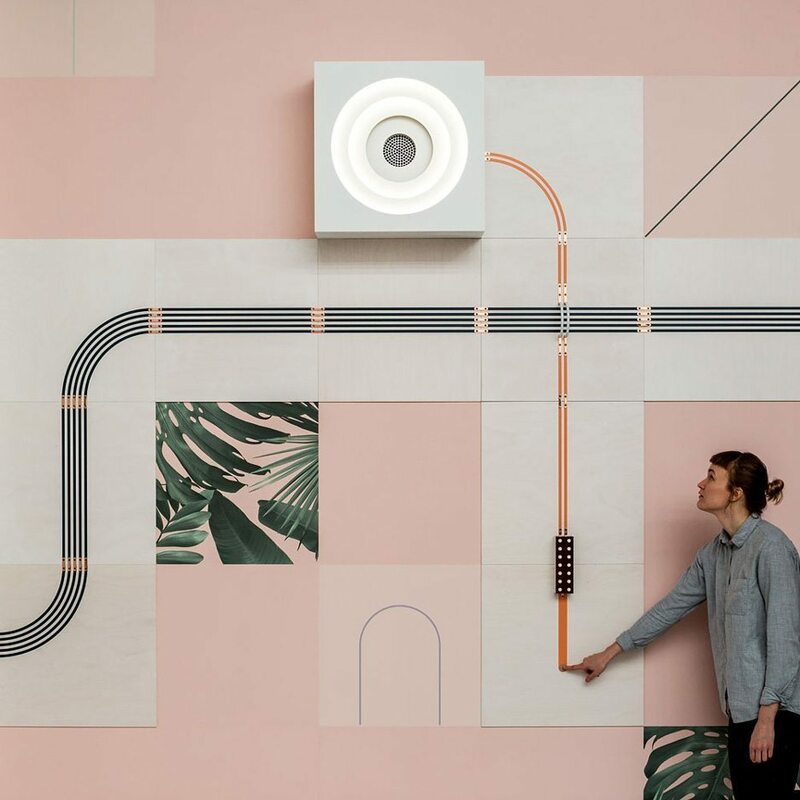 These two Brooklyn-based companies have teamed up to develop an interactive wall covering that combines conductive wallpaper and functional devices. Called Conduct, the art installation turned scalable product was demonstrated at the 2017 Collective Design Fair, held between May 3 and 7 in New York City during NYCxDESIGN. Integrating 2D and 3D elements that can be activated by touch, the covering makes for an immersive artistic experience. Conduct is comprised of wallpaper printed with conductive ink patterns and punctuated with copper switches and bridges connecting it to the device. Five objects were used in the installation at the fair: a lamp, a light box, a fan, a speaker and a mirror. Upon touching one of the copper dots, the electrical circuit is complete, and the device turns on. Conduct required expert calibration and hours of work, so now it’s more of a work of art and a concept than a commercial product. But Jon Sherman, Flavor Paper’s founder and the man behind the water-based conductive ink used, thinks Conduct would ultimately serve as a functional, interactive and immersive wall covering for interiors.